Isaac Asimov memorably identified the three major types of science fiction as “What if,” “If only,” and “If this goes on.” Magnificent works have emerged from each of these categories, but readers — and writers — have reserved their greatest love for the first of the trio. Asking simple, counterintuitive, counterfactual, or even childlike and naïve questions — the kinds that begin with those two words — seems to unlock the storytelling imagination like nothing else. In many cases, what follows naturally from “What if” is something almost as fundamental to speculative fiction: the Big Idea. A massive, revolutionary, visionary conceit that practically begs to be instantiated in fiction. Big Ideas are the highbrow cousin of the Hollywood “elevator pitch,” a concise formulation of a winning premise. (And sometimes a Big Idea gets positively reductive, producing a “Big Dumb Object,” such as Larry Niven’s Ringworld.) The Big Idea might very well be attended, in an SF novel, by a flock of lesser idealings to help support it. But generally, the core notion looms at the center, like a monarch on the throne. Recognizing the centrality and importance of such crystallizing conceits, author John Scalzi even invites his peers to discuss the Big Ideas behind their own projects at his popular blog, Whatever. Some Big Ideas, of course, prove derivative; others shrink on the page for want of narrative oxygen. But two recent novels exemplify the marvelous possibilities of this classic approach to speculative fiction. In Arctic Rising, Tobias Buckell presents a gripping and convincing near-future scenario that is composed of many beautifully machined speculative parts, which all cohere into a stirring, verisimilitudinous portrait of our world circa 2050. Additionally, he provides a thriller-style plot worthy of Hitchcock or Neal Stephenson. But at the heart of the novel is a single thought seed: “What if a wild-eyed, maverick geo-engineering project intended to counter climate change was indeed carried out?” Around this notion Buckell secretes a pearl of a book, with many intricate laminations. Buckell’s previous novels have been funky, baroque, rather gonzo outings: hipster space operas. In this novel, he strips down his prose, characters, and plot to a more “commercial” level without sacrificing his unique voice or genre integrity. He concentrates on extrapolations of the Brunner-Gibson-Doctorow-Stross variety to produce a propulsive and readable novel that performs SF’s essential function of creating a totally believable world ripped from tomorrow’s headlines. But this bustling new free enterprise zone is being threatened by the actions of the Gaia Corporation, whose secret macro-engineering scheme promises to undo the new realities and restore the status quo ante. In this setting, the novel’s sly title becomes a three-pronged phrase: the Arctic is rising as a powerhouse region even as its ocean waters inexorably rise, and at the same time that its citizens are rebelling. Buckell keeps these three plates spinning with a juggler’s precision. While on patrol one day, Anika Duncan, Nigerian-born dirigible pilot for the United Nations Polar Guard, intercepts a tramp freighter doing suspicious things. Shot down by the crew, she survives, only to find that what she has witnessed has put her on the hit lists of several covert, competing factions. Over the course of just a few days, Anika will be hounded and chivvied across the Arctic (giving Buckell a plausible reason to show us an impressive range of venues), her life in constant danger. She’ll lose old friends, make new ones, and generally comport herself with bravery, resourcefulness, and intelligence, eventually ferreting out the true dimensions of the plot and taking bold, risky actions to stymie it. Though she fits the type of a plucky action hero well enough, Buckell’s depiction of Anika is a solid, flexible, rich construction, endearing to any reader, I am sure, and providing a beautiful entry point into this radically different world. In the best tradition of this subgenre, Buckell spins off great satellite ideas around his Big Idea on every page. Think that Chinese manufacturers like Foxconn represent the apex of such mercenary ventures? What about floating factory ships that hover above oil feedstocks and churn out plastic toys in situ? That’s just the barest sample of Buckell’s lateral thinking. Buckell — who was born in the Caribbean — has long favored a multicultural approach to his fiction, and he continues in that vein here, careful to present a wide range of ethnicities and worldviews, from Anika on down. And if this book has any slant, it’s a liberal-leftist-netizen leaning. But at the same time, Buckell revels in enough gunplay and violence and Realpolitik to deter any charges of touchy-feely wimpiness. In fact, although Anika agonizes over various deaths and brutalities, with each fatality being accorded proper moral gravitas, she shows no hesitation in shooting up the scenery when necessary. One might even charge Buckell with a little too much enjoyment of the resulting carnage. But then again, Big Ideas generally leave big swaths of creative destruction in their wake. America, a jealous, backward, fragmented, fundamentalist-ridden failed nation, is responsible for the terrorist-driven, airplane-mediated destruction of the World Trade Towers of Baghdad, cosmopolitan metropolis of the United Arab States, that enlightened, progressive, technology-rich superpower in a continuum just one funhouse mirror removed from ours. The event occurs not on 9/11/2001 but on 11/9/2001, that off-kilter date serving as just the merest hint of the radical transvaluation Ruff has in store. And the novel is set more or less ten years after, in the long, grinding aftermath of that event. Ruff leads with a charming, utterly engrossing cast: Mustafa, Samir, and Amal, with Mustafa the privileged point of view — three UAS Homeland Security agents who will invariably provoke thoughts of the Mod Squad. But any intentional campiness functions as just a slightly quirky flavor to their tight-knit ensemble, as they undertake perilous campaigns against Christian terrorists. 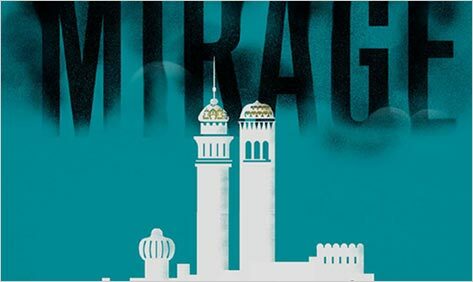 And coming to dominate their assignments are rumors of “the mirage,” the alien fundamentalist belief that their world of Islamic hegemony is a fictitious one, somehow deriving from another, prior, more “real” continuum. And when actual artifacts from the crazy alternate history — our world, of course — begin to bleed over, events really begin to get weird, in the manner of China Miéville’s The City & the City. Aside from satisfying the traditional requirements of any good story — dramatic character arcs, suspenseful plotting, fusion of theme and action — which he does admirably, Ruff’s titanic accomplishments with this book lie along two parallel yet complementary axes. Mention of this Zionist dislocation brings us to the second aspect of the book, the estrangement lurking beneath the acute mimesis. Ruff is out to blow your mind with the way things might have gone, given a few divergent forks in the historical road. And much of this estrangement is conveyed in the alternate careers of famous people, rendered completely believable. Saddam Hussein is a notorious gangster. Osama bin Laden is a right-wing senator. Gaddafi is the Jerry “Governor Moonbeam” Brown of the nation. Without over-reliance on the shorthand, ready-made personalities of the famous — a common misstep in shoddy alternate histories — Ruff still employs these recognizable personages (mostly offstage, except for Saddam) as perfect foils for his tale. And I haven’t even spoiled many of the most surprising appearances. Finally, Ruff doesn’t fudge the ontological weirdness of his world. When you learn what triggered the birth of this parallel timeline, you will be astonished at his audacity. These two strong pillars — the richly sub-created timeline and its salient anamorphic reflections of our own era — together make for a book that will captivate upon an initial surface reading and trouble your certainties long after.